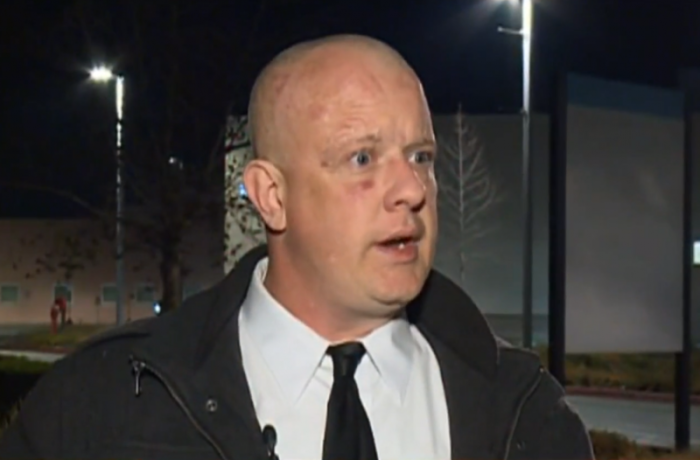 A Salvation Army bell ringer and minister who was collecting donations and spreading holiday cheer in front of a Walmart store in Roseville, California, got the shock of his life Wednesday when he was battered by an unidentified man for wishing him a "merry Christmas." "He haymakered me, hit me, got me down on the ground and we started wrestling, at that point I'm fighting for my life," the Rev. Jamie Wolfe, Sr., told CBS Sacramento. It was "definitely unexpected," Wolfe, who suffered bumps and bruises from the attack, said. "I greet everybody 'merry Christmas.'" Police say the bell ringer's attacker is still on the run but there's hope that surveillance video can identify the man who tried to silence Wolfe's Christmas cheer. Lt. Steve Pavlakis with the Salvation Army told CBS, "[The] store says they love him and he's been the best bell ringer they've ever had, so an attack that's unprovoked is very surprising and very unfortunate. It's not the call we'd expect to get at night. It's really saddening that one of our bell ringers would be out there working day after day for us that's met with hate and punches to the face and kicks to the face." The "merry Christmas" greeting has been a flashpoint in the "war on Christmas" debate in recent years. While on the campaign trail in 2015, President Donald Trump promised that he would do away with political correctness and push the traditional "merry Christmas" greeting at "every store." "I'm a good Christian. If I become president, we're gonna be saying 'merry Christmas' at every store," he promised voters in Iowa in 2015. "You can leave 'happy holidays' at the corner." Just last month as he lit up the Christmas tree at the White House, he tweeted: "Today is a day that I've been looking very much forward to ALL YEAR LONG. It is one that you have heard me speak about many times before. Now, as President of the United States, it is my tremendous honor to finally wish America and the world, a very MERRY CHRISTMAS!" A new Pew Research Center survey released this month found that most U.S. adults believe the religious aspects of Christmas are emphasized less now than in the past and a growing share of them say it does not matter how they are greeted in stores and businesses during the holiday season — whether with "merry Christmas" or a less-religious greeting like "happy holidays." The study further noted that there was a noticeable decline in the share of U.S. adults who say they believe that biblical elements of the Christmas story — that Jesus was born to a virgin, for example — are historically true. While most Americans still celebrate Christmas as a religious holiday, there has been a slight drop in recent years in the share who say they do this. Currently, 55 percent of U.S. adults say they celebrate Christmas as a religious holiday, according to the survey. This includes 46 percent who see it as more of a religious holiday than a cultural holiday and 9 percent who celebrate Christmas as both a religious and a cultural occasion. Some 59 percent of Americans said they celebrated Christmas as a religious holiday in 2013, including 51 percent who saw it as more religious than cultural. Despite the attack he suffered from his "merry Christmas" greeting, Wolfe explained that he had no plans to stop spreading his Christmas cheer. "It's really rewarding," he said. "I'll be right back out there doing it again tomorrow."